Test Instructions: This is a multiple-choice type of questions consisting of 35-items. 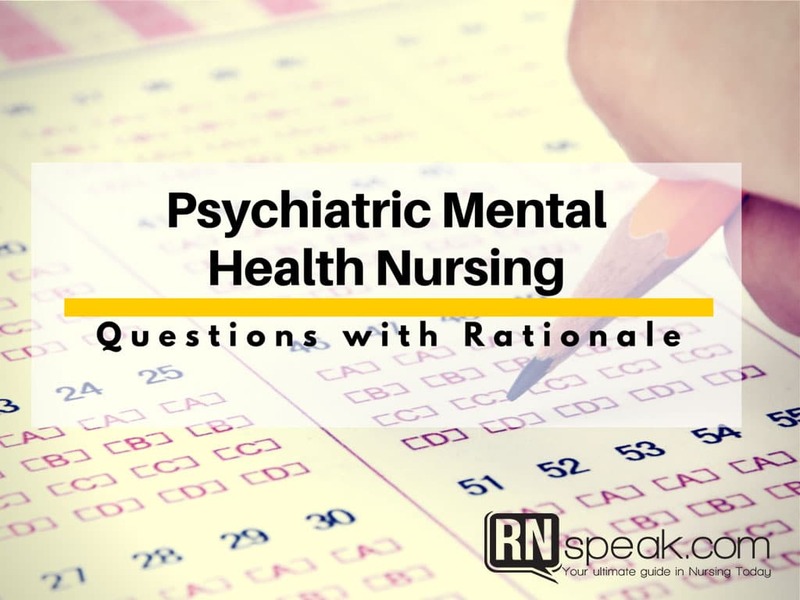 Each question tests your knowledge on one of the basic subjects in nursing, i.e. Psychiatric-Mental Health Nursing. They are objective type of questions which are based from the facts; it is very important to use your critical and reasoning skills. The rationales are included once you finished the set. If there are questions that have a similarity to other sources, the author doesn’t intend to do it; instead, she hopes to enhance your knowledge on the said area. 1. Mental health involves a lot of interdependent determinants including behavior, social and emotional wellness and the like. Which of the following factors is not included in categorizing the mental health of an individual? 2. Diagnostic and Statistical Manual of Mental Disorders (DSM-IV-TR) explains all mental disorders that outline specific diagnostic criteria. Which of the following patient’s condition belongs to Axis II (multiaxial classification system)? 3. The pineal body is an endocrine gland that influences the activities of the following except? 4. Which of the following lobes of the cerebrum controls the moral reasoning of a person? 5. Dopamine is a neurotransmitter that is located in the brain stem. Which of the following amino acids it is synthesized from? 6. A neurotransmitter is a chemical substance that aids in the transmission of information throughout the body. Which of the major neurotransmitters that has a neuromodulator effect? 7. Brain imaging techniques are used to detect any mental disorders. Which of the following techniques has the fastest duration of obtaining the result? 8. Studies have shown that there are certain types of mental illness that is brought by genetic links. To determine this, three types of studies are used to investigate the genetic basis of mental illness. Which of the following is not included in the types of studies? 9. Nurse Anne understands that in caring for a patient with a mental disorder, the outcome is greatly influence by the medical management. She should know the side effects, contraindications, interactions, and nursing intervention. Which of the following principles can she use as a guide in providing pharmacologic treatment? a. Sometimes a client may need higher dosage to stabilize his or her target symptoms, whereas lower dosages can be used to sustain those effects over time. b. As a rule, older adults require higher doses of medication than younger patients to experience therapeutic effects. c. Psychotropic drugs should be lowered abruptly rather than tapering. d. Follow up care is not essential if the planned outcomes are already obtained. 10. Extrapyramidal symptoms are serious neurological symptoms which indicate the major side effects of antipsychotic drugs. Which of the following drugs used in the treatment of EPS that is not categorized as anticholinergic drug? 11. While Nurse Anne checks on her patient, she noticed that he is having an orthostatic hypotension, dry mouth, and photophobia. She knows that her patient is experiencing anticholinergic effects. She should not worry because she knows that these symptoms usually decrease during? 12. Tardive dyskinesia is a syndrome of permanent involuntary movement. It is commonly caused by long-term use of conventional antipsychotic drugs. Which of the following interventions is not applicable in preventing TD? a. Clients who already developed signs of TD but still need to take antipsychotic drugs should be given atypical antipsychotic drugs that have not been found to cause signs of TD. c. Monitor client periodically for initial signs of TD using Abnormal Involuntary Movement Scale. 13. Clozapine compared to other antipsychotic drugs produces fewer side effects. Which of the following is considered as the fatal side effect of clozapine? 14. Nurse Anne was been assigned to classify the antipsychotic drugs. Which of the following should she isolate if her patient is at high risk of cardiac arrest? 15. Antidepressant drugs are used for the treatment of anxiety disorders, psychotic depression, major depressive illness, etc. Which of the following drugs is labeled under cyclic compounds? 16. Client teaching is one of the most important factors in caring for patients who have mental illness. The nurse is incorrect if she will tell the client which of the following teachings? 17. Monoamine oxidase inhibitor drugs were discovered to have a positive effect on people with depression. But since they have little effect on sedation and anticholinergic effects, they must be used with extreme caution. Which of the following reasons explains this extreme caution? a. A life-threatening side effect, hypertensive crisis may occur if the client ingests food containing tyramine while taking MAOIs. b. It can cause seizures at a rate four times that of other antidepressants. c. Can cause aplastic anemia at a rate five to eight times greater than the general population. d. Can cause serious rashes requiring hospitalization, including Stevens-Johnson syndrome. 18. Lithium is considered as the best mood stabilizing drug. In using this drug, which of the following statements should not be included in the client teaching? a. Monitor blood levels periodically. b. The time of the last dose should be accurate so that plasma levels can be checked 24 hours after the last dose has been taken. c. Take these medications with meals to minimize nausea. d. The client should not attempt to drive until dizziness, lethargy, and fatigue has subsided. 19. Freud believed that in order to protect self, one uses ego defense mechanisms to cope up with basic drives. Which of the following ego defense mechanisms correctly describes intellectualization? a. Modeling actions and opinions of influential orders while searching for identity or aspiring to reach a goal. b. Excusing own behavior to avoid guilt, responsibility or conflict. c. Separation of the emotions of a painful event or situation from the facts involved. d. Dealing with emotional conflict by a temporary alteration in consciousness or reality. 20. Freud developed the five stages of psychosexual development while Erikson extended his work and come up with eight stages of psychosocial development. Which of the following tasks should be attained during ego integrity versus despair stage? b. Achieving a sense of control and free will. c. Emerging confidence in own abilities; taking pleasure in accomplishments. d. Accepting responsibility for one’s self and life. 21. According to Sullivan, emotional problems are brought by inadequate or non-satisfying relationships. He established five life stages of development. Which of the following stages where the focus is “shift to the syntaxic mode begins”? 22. Existential theorist believed that when a person is out of touch with himself or the environment it will result to behavioral deviations. Which of the following is been introduced by William Glasser? 23. Proxemics is the study of distance zones between people during conversation. Which of the following zones should be the distance that is acceptable for communication in social, work or business settings? 24. Touching a client can be comforting and supportive especially if it is being permitted. Which of the following types of touch is used in greeting such as handshake? 25. It is very important for a nurse to use active listening and observation when establishing a therapeutic interaction. Which of the following does not support this statement? a. Interpret and respond to the message subjectively. b. Recognize the issue that is most important to the client. c. Know what further questions to ask the client. d. Use additional therapeutic communication techniques to guide the client in describing his perceptions fully. 26. When Nurse Anne tells to her patient, “Does this contribute to your stress?” what type of therapeutic communication she used? 27. What therapeutic communication technique will a nurse use if she wants to bring out important points of the discussion and increase the awareness of both parties? 28. When Nurse Anne uses various types of therapeutic communication techniques, which of the following is her goal? a. It impedes the communication process. b. To stop the conversation thus makes it difficult to continue to interaction. c. Establish rapport with the client by being sympathetic. d. Gain an in-depth understanding of the client’s perception of the issue, and foster empathy in the nurse-client relationship. 29. Problem solving is used during crisis intervention. It helps the patient to find ways in order to solve a certain situation. Which of the following is not included in finding a solution? a. If dissatisfied with the results, discontinue the process. c. Brainstorm all possible solutions. 30. Hardiness is the ability to resist illness when under stress. Which of the following is not a component of hardiness as described by Kobasa? 31. If Chinese believed that mental illness is caused by lack of harmony of emotions and evil spirits what do the Filipinos believed? a. Loss of mental self-control caused by evil spirits, punishment for behavior or not living good life. b. Lack of spiritual balance. c. Disruptions of harmonious function of individual and spirit world. 32. Which of the following is not considered in working with individual responses to illness? a. Remember that a wide variety of factors influence the client’s complex response to illness. b. Ask the client at the beginning of the interview how he prefers to be addressed. c. Approach the client with a genuine caring attitude. d. Recognize any positive feelings or stereotypes and discuss them with a colleague to dispel myths and misconceptions. 33. Thought process refers to how the client thinks. Which of the following describes “tangential thinking”? a. Wandering off the topic and never providing the information requested. b. A client eventually answers a question but only after giving excessive unnecessary details. c. Excessive amount and rate of speech composed of fragmented or unrelated ideas. 34. Affect is defined as the outward expression of a client’s emotional state. Which of the following correctly defines “blunted affect”? a. Displaying a full range of emotional expression. b. Showing little or a slow-to-respond facial expression. c. Showing no facial expressions. d. Displaying one type of expression, usually serious or somber. 35. When a nurse assesses his patient, he noticed an overall slowed movement. He is correct if he identified it with which of the following terms?